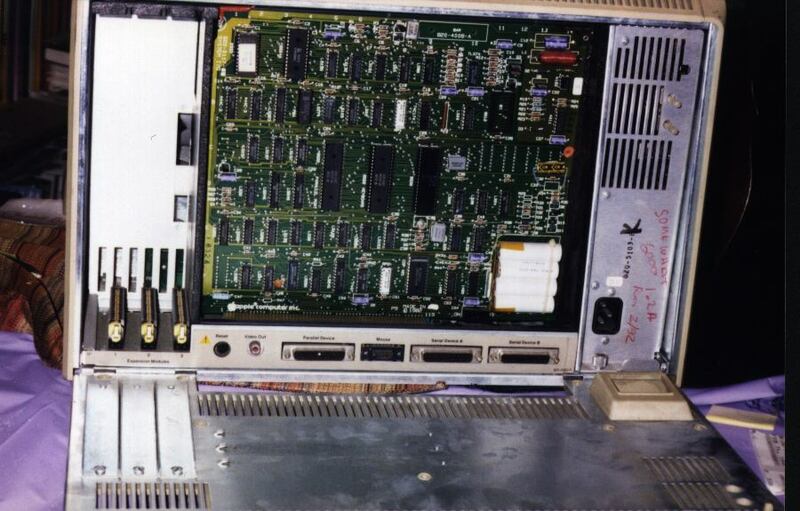 Here you can see the exposed internals as viewed from the back of the Lisa. On the left side, the expansion port bay reveals 3 open slots. The Lisa's Parallel Port card would for example fit in one of these. Unlike PC's, the Lisa's cards, had a metal pull out tab that you had to pull out before inserting a card. The card wasn't inserted in from the top, but rather, it slid in, and the you'd turn the metal pull out tab to lock the card in place. If you look on each of the three connectors, you'll see a yellow bit of plastic with a bit of metal in the center. That bit of metal is the pull out tab. To the right of the expansion bay, you can see the inserted motherboard with the I/O card visible. Above the motherboard bays to the right you can see the power supply. This one has my comments on it. I wrote on the power supply because I've had several power supplies that were dead. The power supply has brightness and contrast controls, an HP power jack, and a hidden switch that shuts off the Lisa incase you take the cover off. This particular power supply is the 1.2A version, not the beefier 1.8A. It does the job, but is a bit weak. For accessing 99% of the Lisa, you don't need a screw driver, and this true of the case. The back cover has two thumb screws at the top that lock the case in. Also, as you can see, the Lisa is highly compartmentalized and easy to disassemble and access. If you look closely at the back cover next to the slot covers, there are three sets of horizontal clips to the right of the slot overs. When you insert a card into the expansion slot, you can use these clips to store the expansion slot bezel on the back cover rather than discard the cover. Compare that to PC's where you'd likely throw away the bezels and then when you remove the card, you'd have a hole in the back of the machine where dust can enter, and also affect the proper airflow.